Heather Book of HOMELife speaking. 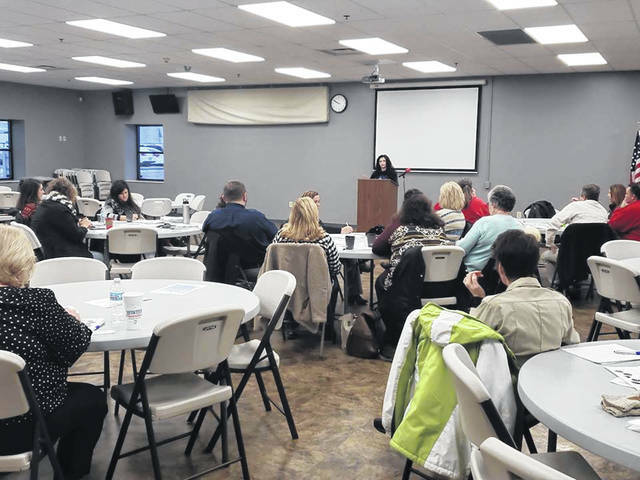 Through the creation of a quarterly public forum, the Portsmouth Area Chamber of Commerce and Main Street Portsmouth have been taking steps they say will bring the community together, build momentum on progress and focus attention on how much goes on that often goes unnoticed. 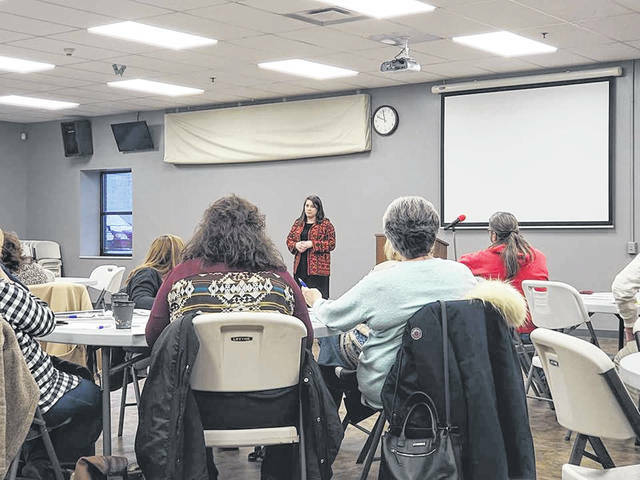 Portsmouth Today is held every three months in the Scioto County Welcome Center, 342 Second St., Portsmouth, thanks to support from Community Action who owns the space. In a prepared statement, the chamber and Main Street Portsmouth said the events will highlight positivity by presenting a series of speakers who will update guests on the community’s public events and projects, answer questions anyone may have and hear input from those in attendance. Pratt says this is also a chance for the community to learn about events in detail. Lisa Carver, executive director of the Portsmouth Area Chamber of Commerce, says she thinks it will be a great opportunity to fill an information vacuum in the area. The chamber also will have calendars available produced through the help of the Portsmouth Area Visitors Bureau and Kim Bauer, as well as Main Street Portsmouth and other organizations. The community calendar can be found at www.portsmouth.org. “This isn’t just an event for community planners or organizers; it is for everyone. We want churches, members of the community, anyone and everyone to attend with open minds and calendars ready to be filled in,” said Pratt. After the quick forum presentations, the event will allow various community leaders, business owners and citizens to socialize and talk about what is going on in the area, making for a very large networking opportunity advertised as unlike any other in the area. The next event is scheduled for March 27 9 am., at the Scioto County Welcome Center. “Portsmouth’s Levi D. York was known for frequently remarking the idea, ‘What will help us individually will help us collectively, and that will mean a larger and better city.’ It is this positive attitude that we want to draw inspiration from as we come together to celebrate our individual victories, plan our schedules around giving support at upcoming local events and celebrating a resilient, hardworking community,” organizers said in summing up the idea of Portsmouth Today. The upcoming forums are open to the public, and everyone is welcome to attend. For questions about the events, call the chamber of commerce at 740-353-7647 or Main Street Portsmouth at 740-464-0203.
https://www.portsmouth-dailytimes.com/wp-content/uploads/sites/28/2019/03/web1_PT2.jpgHeather Book of HOMELife speaking.